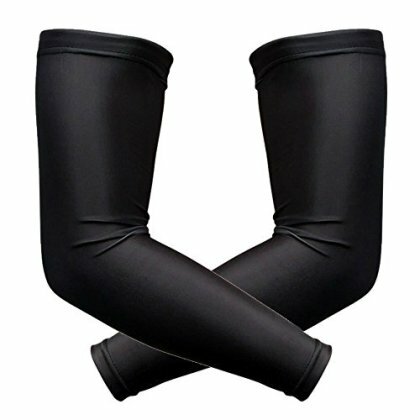 1 PAIR OPTIMIZED COMPRESSION: Engineered compression arm sleeves to keep your arms cool and your muscles warm. GREAT SUPPORT: Improves muscular endurance and speeds up recovery. PREMIUM MATERIAL: Professional grade material (nylon & lycra blend). Perfectly designed for everyday comfort and durability. IMPROVE CIRCULATION: Precision support to provide optimal comfort and promote healthy blood flow. Designed to boost circulation to accelerate muscular recovery. PROTECTION: Provides protection from harmful UV rays. Bucwild SportsTM Compression arm sleeves were designed by everyday athletes to be worn comfortably all day long for all day compression. - And all types of activities! ***PLEASE NOTE*** OUR SIZES MAY BE DIFFERENT THEN OTHER BRANDS. TO GUARANTEE YOU ORDER PERFECT FITTING SLEEVES MEASURE THE LARGEST PART OF YOUR BICEP AND CHOOSE SIZE THAT MATCHES YOUR BICEP MEASUREMENT.